The weather became drastically cold, bearing down to mid 40s. It has been raining and outside has been cloudy, dreary, and moody. That’s what is so different about my outfit. 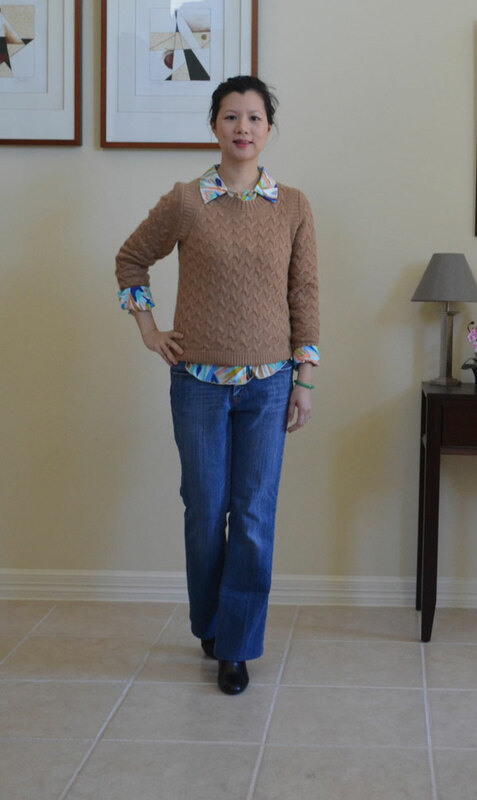 I love the pop of color the Missoni blouse brings to the outfit. I am wearing a XS in the blouse. It fits great however after moving around, its length is a bit short and also the arm length is a tad short. I prefer longer sleeves and a longer length for my shirts. Not a big deal and it’s hardly noticeable. Target’s Missoni line has been MIA for a quite a while. I was surprised to see it come back after New Years. I assume it was long gone. On this Target.com shopping spree, I managed to pick up the line’s floppy hat, scarf, the zig zag dress (XL in girls sizing – cheapers by $20 compared to Women’s sizing! ), and 2 blouses. While shopping, many Missoni items were still MIA however 4 nights ago, many items popped back up. Use this COUPON: TGTHTT5Z for 10% off your online order. Expires 1/29/2012.